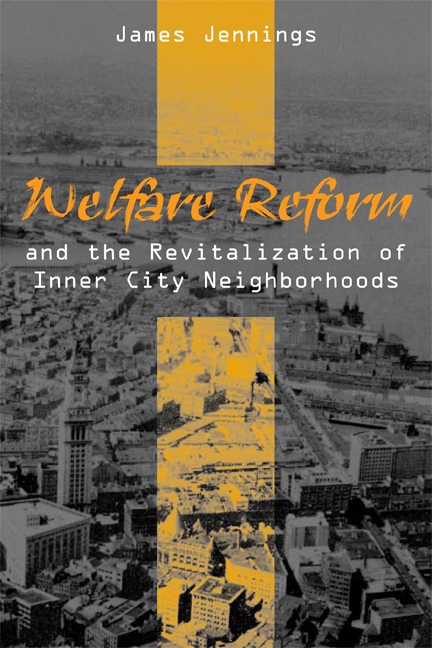 Welfare Reform and the Revitalization of Inner City Neighborhoods examines the institutional impact of welfare reform on community-based organizations. Unlike many studies that treat children and individuals of families as the units for analyzing the effects of public policy, Jennings uses a case-study approach involving three low-income neighborhoods in Massachusetts, which assesses the effects of welfare reform based on the neighborhood. The significance of Jennings’s work shows an inconsistency in the increasing call upon foundations and government for building social capital and civic participation as a response to problems faced by inner-city communities, as well as the institutional effects of welfare reform. James Jennings is Professor of Urban and Environmental Policy and Planning at Tufts University. He is the author of The Politics of Black Empowerment, which received the Gustavus Myers Award for Best Book on Human Rights in 1993.